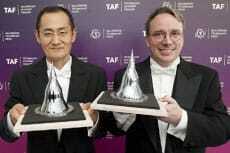 Linux creator Linus Torvalds and stem cell pioneer Shinya Yamanaka are joint recipients of the 2012 prize, an honor that some call the tech equivalent of the Nobel Prize. That means they will split the €1.2 million ($1.5 million) prize money 50-50. Torvalds and Yamanaka were named as a finalists for the prize back in April, but it was assumed that one or the other would be singled out as a grand-prize winner. The joint award comes as a bit of a surprise. Other notable scientists, including Tim Berners-Lee, have won the prize since it was created in 2002, but this is the first time judges have made a joint award. The prize is awarded every two years.